The sun is a potent source of energy with enough strength to power an entire home; more specifically, power your entire home. That’s right—solar energy gives homeowners the ability to operate appliances, lights and home comfort systems in a more affordable and environmentally friendly way all year long. Some individuals fear the switch to solar power; however, the team at Mauzy Heating, Air & Solar will guide you through the residential solar installation process. Plus, Mauzy guarantees that your new system will maximize your energy savings— without sacrificing an ounce of your comfort, and we only install the best solar panels with a 25-year warranty, the leading warranty in the solar industry. Most homeowners aren’t aware of the solar installation process and most importantly how easy we make it when you trust the team at Mauzy. In a nutshell, once you’ve entrusted us with your solar installation, the process is completely hands off for you! We take care of it from “scope” to nuts! Step 1: A Mauzy solar associate will visit your home to inspect the house and discuss the energy needs of your family so that we can provide a solar quote. Step 2: Once the homeowner accepts the quote, our Solar Division Manager visits your home once more for a pre-site inspection. During the pre-site, we verify that the system is compatible with the home and make sure there are no issues to address before solar installation begins. Step 3: We begin the process by pulling the permit on behalf of the homeowner and getting you scheduled for solar installation. Step 4: Installation. This is typically only a 1-day process. Step 5: We set up the inspection with the city/county to ensure the project was completed to code. Step 6: We work with SDGE on behalf of the homeowner to get “Permission to Operate” the system. The approval process is typically within one week of receiving the final inspection. Step 7: We meet with you at your home to turn on your new solar energy system. We review the entire installation as well as everything you need to know about your solar system including the location of your electrical panel, breakers in the panel that control your new system, and many other items. Solar installation is an investment. That’s why its crucial to choose a system that is tailored to match your home’s size, location and energy needs. 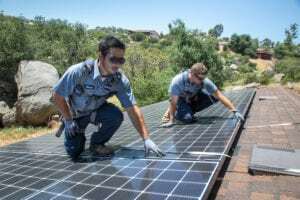 The solar contractors at Mauzy can help you determine the ideal solar panel system for your San Diego residence. For decades, Mauzy Heating, Air & Solar has proudly served the residents of San Diego. As a local business with deep roots in our community, the Mauzy family name is one that you can trust for any and all of your solar needs. To explore solar panel installation for your home, simply fill out our online form or call Mauzy, Heating Air & Solar at 858.900.3909 today!